Ombattu Gudda / Ombattu Gudde / Ombathu Gudde is @ an altitude of 971m in the Kabbinale reserved forest range accessible from Hosakere (near Mudigere) as well as from Gundya. The usual trek trail is to start from Gundya check post (in NH48 / Mangaluru / Mangalore highway), head towards a water falls, climb up Ombattu Gudda, get down @ Hosakere and take a bus to Mudigere. BUS : YOU CAN TAKE A DIRECT BUS FROM BANGALORE TO MANGALORE GOING VIA SAKLESHPURA ROUTE AND GET DOWN AT SAKLESHPURA. TRAIN : TRAINS ARE AVAILABLE TO SAKLESHPURA AND I SUGGEST YOU TO TAKE A TRAIN WHICH LEAVES AT NIGHT. 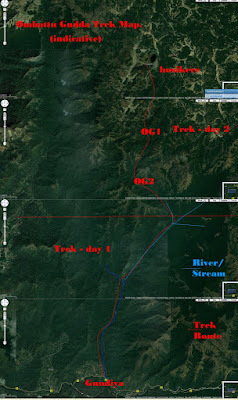 BUT I ALWAYS SUGGEST YOU TO TAKE YOUR OWN VEHICLE(CAR TO TEMPO TRAVELER) FOR THIS TREK . From Sakleshpur take the Shiradi ghats route to reach Gundya check post by day break and then take the jeep track towards Ombattu Gudda . The jeep track initially will be amidst houses; but, as you progress, it is narrowed down and will become a small footpath. The actual trek begins from this house. There will be some signs of moisture and good greenery even @ this peak summer; the path has a good 'junglee' feel about it. In little more than an hour from the main road, when you will find yourselves near the first stream, which will be dry in the summer. It is here that you will first spot the leeches. Next break is another hour away, in an open land, from where you can catch a glimpse of the mountains . 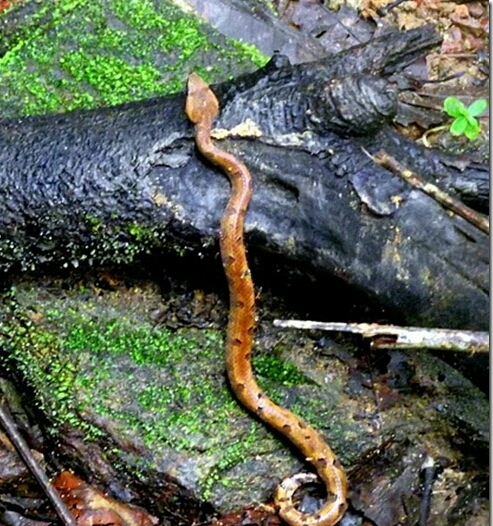 You can find the number of obstacles, fallen trees, branches growing into the path ... etc..Be aware of the snakes. You can see that every now and then. By about 30 mins along that path,you will be near the Kabbinale Hole, where you plan to get fresh and take your breakfast. The stream will be li'l stagnant on one side, but has clear water on the other side.The major part of the trek is only going to start now and you need to move fast to make it to the grass lands before the light fades. It is from here that the real trek starts. After a few minutes of making your way through the river ,bushes and rocks. If you're going together in a group,see to it that everyone are moving at a same pace or else you are more likely to get missed out. "Welcome to Ombattu Gudda - the paradise for people who wants to get lost!" Looks like most gangs, heading to Ombattu Gudda, are getting lost around this stretch. If u observe the map carefully, we need to head north a little while from the river and most of the people heads towards the jungle right here.You should ideally, follow Kabbinale Hole for almost an hour before turning north among other smaller streams. For most part of the trek, the path is pretty close to one of the streams till the last climb to the grasslands. You will walking along the river and it will be going on for some time. The path criss-crossed the river every now and then and you keep following the stream and recheck positions on GPS and map every now and then to make sure that you are on the right track. The going will be tough with slippery rocks and time running out. It is important to make sure that everybody kept together. After walking for abt 3 hrs along the river, you will finally reach a waterfall. In another hour you climb up by the side of the falls and head up where the trail gets steeper from here on and the rocks will be slippery. This ensured that you take more time to head towards your camping point. The final climb is supposed to take you to the grass lands . It 2km vertical climb and a very tough one and that mean you have to hurry. Walking in the slippery rocks is easier without the shoes ,On the way, you will cross one stream after the other and climbed one slippery rock after the other. Finally,after this vertical climb you will reach the top and you can easily find the camping space @ the top. 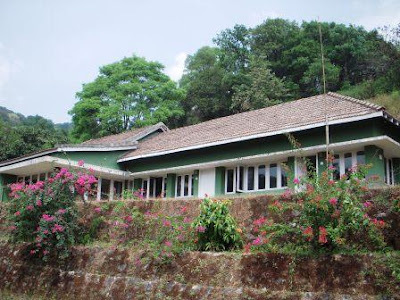 You can find lush green and bright even in the night, with a view of the sky and the far away hills! There are no water sources in the hills from now on after you cross that vertical climb of 2kms and it is important to carry enough water. When you look around, there will peaks all around you, but the map says Ombattu Gudda is towards the different direction from your camping site,most probably north-east. Hence start moving along direction shown in your gps tracker/equipment. It Is quite important not to lose altitude. Your path, even now is among the bushes, occassionaly with a view of the surroundings. But, as soon as you reach the next grassland, it will all change. There is some beautiful views on offer all around you. 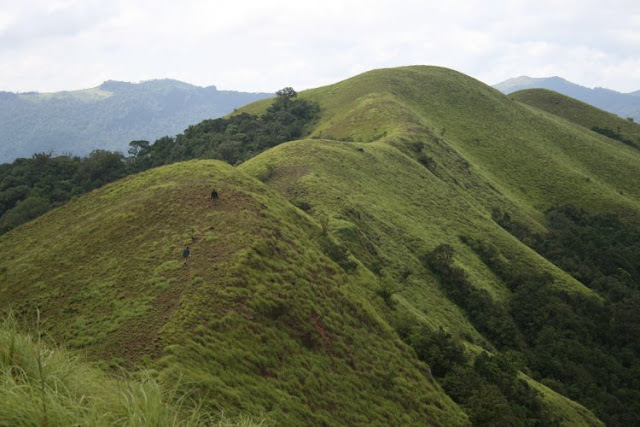 Lush greenery till the horizon, punctuated with dark green areas of thick shola forests, covering mountain ranges on all four sides. You have one more step from this to reach the peak. Follow the gps tracker. And finally you will be almost in celebration mode with only about some mts ascend left to the peak and tiredness already give way to excitement of finally making it to the Ombattu Gudda. You can see the jeep track heading to Hosakere to your left when you reached the hill just before Ombattu Gudda. From here, the jeep track may be accessed to your left (North-west direction) and Ombattu Gudda to your right (eastwards). From here to Ombattu Gudda peak is straight forward,Couple of ups and downs. Ombattu Gudda is definitely not the tallest peak around. There will be even more majestic peaks all around you, seperated by deep valleys and thats one more reason why the surroundings looked so beautiful! There is a trail, along the bushes all the way till the Lakshmi estate premises, where you can hit the jeep track heading to Hosakere. It is back to civilization with a few workers around this area. 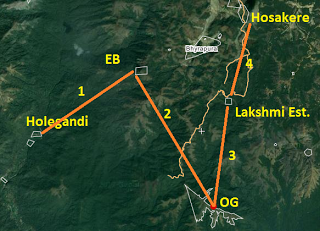 The jeep track will lead to Hosakere where you get the bus to sakleshpura main station. 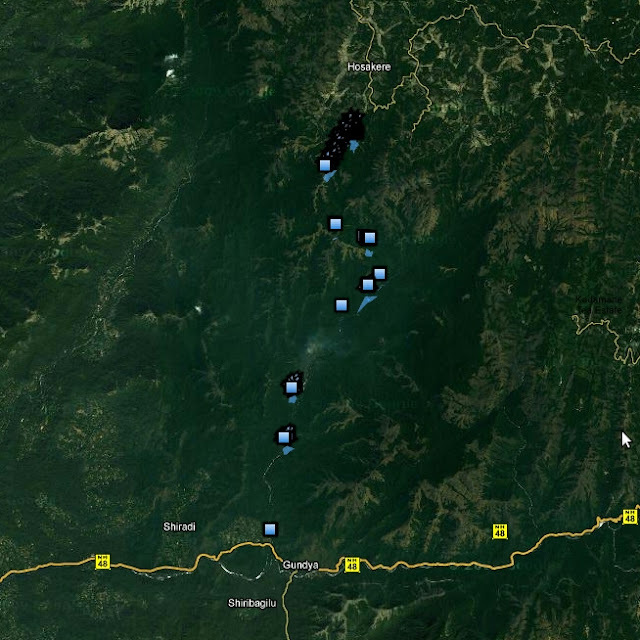 Though, Hosakere is abt 13kms from this point, it is a little lesser to the tar road. This is probably the toughest part of the trek, with an ascend in the beginning and hot sun @ its zenith. The jeep track actually goes higher than Ombattu Gudda @ 1065m, when it winds around a hill and offered good views around you. Once the ascend is over and some tree-cover is available, giving shade, things became easier. The tarred road is about 3kms from this point and you keep meeting people telling you that it is 'just ahead'. You have to cross a gate in between and you get buses as soon as you reach the tar road.It is time to go home after an exciting trek. Does the trek live upto the hypes in a few other blogs? To some extend! 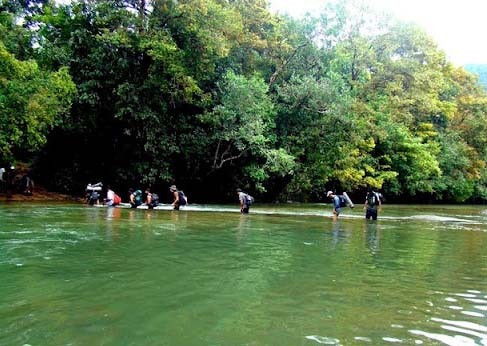 At the same time, its surely not an absolutely tough trek to do with a 99% chance of getting lost in a thick jungle infested with wild animals. 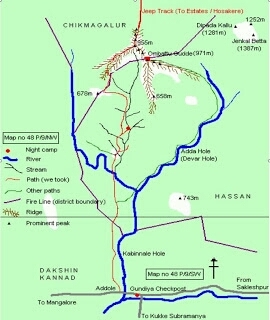 An experienced trekker, equipped with the map and compass, should be able to find the way.